St. John the Baptist, the Herald, the Forerunner of Christ was also "He who came to the Light." Leonardo da Vinci conveyed this theme through the gesture of the index finger pointing heavenward and the spiraling body emerging into the light. 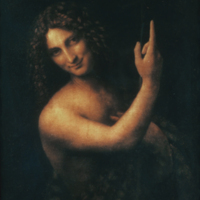 The face of St. John the Baptist with its gentle smile is androgynous, in accordance with a doctrine identifying the Forerunner as the New Adam, who was created with a dual nature. Although the St. John was at one time assumed to be the last of Leonardo’s surviving paintings, it now seems more likely that the Virgin and Child with St Anne and a Lamb (Paris, Louvre) occupies this place. 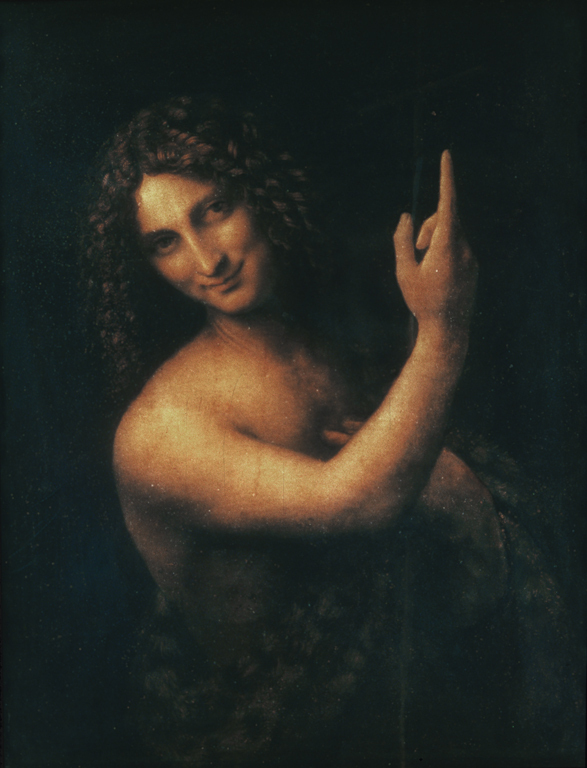 Leonardo da Vinci (Italian painter, 1452-1519), “Saint John the Baptist,” Institute Images Online, accessed April 24, 2019, http://westerncivart.com/items/show/2934.